Rhymes With Snitch | Celebrity and Entertainment News | : Meghan Markle's Father Faking Heart Attack? Meghan Markle's Father Faking Heart Attack? Earlier this week Meghan Markle's father claimed he suffered a heart attack that would prevent him from walking his daughter down the aisle when she weds Prince Harry, right after he was caught staging paparazzi photos [click here if you missed that]. Thomas Markle Sr was photographed by DailyMail.com at a McDonald's drive-thru on Thursday afternoon where he picked up two Happy Meals and a chocolate milkshake covered with whipped cream around lunchtime. A few hours later, Thomas was spotted again as he pulled into a KFC near the Mexican border for dinner, grabbing himself a bucket of chicken for dinner. This despite the fact that he is now claiming to have suffered a heart attack just two days prior to his back-to-back fast food feasts. Snitch, we don't care anymore. 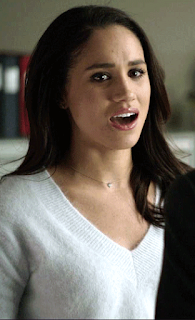 Meghan. Girl you better cut all these fukkkas off. I got family like this. If I got married they wouldn’t know it until they heard it from someone else. talking about doing the most? Damn..
well hell, if he is eating like this he is on his way to a heart attack. Snitch, girl, no one cares what these white people are doing. They told him to say he had a heart attack. I told y'all the big mouth brother will be speaking out on this soon...and only then we'll know the truth. He was never fitted for a suit, never met his soon to be son in law, and never was invited to the wedding. This is all smoke and mirrors! Meghan will cut ties to her ENTIRE family. To the people who say they don't care, you should care. This whole matter has more to do with precious metals, fiat currency failure, natural resources in Africa, and a United States faces hyper-inflation and the world trading with every other country BUT the United States. This marriage is about Brexit and the UK's plans for Africa post-EU departure. Look at the bigger picture and buy your water and canned goods now. And I thought Meghan had the worst in laws...look like the white Markles are showing the royals how low white people can really go.